Taking up space in junkyards, landfills, and garages everywhere are old mailboxes. However, when ingenuity takes over, people find new ways to use them. And it has nothing to do with the postman. If you have an old mailbox or two lying around, or if you love to upcycle the old, then these ideas are for you! 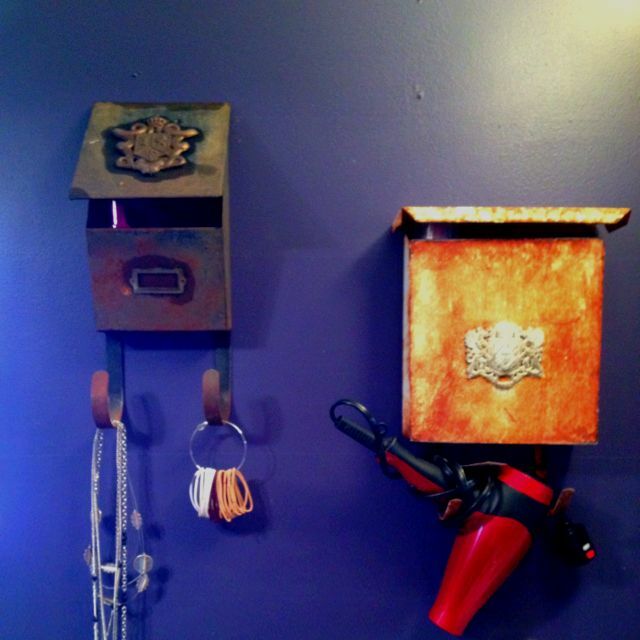 Jump below to see how people are turning all sorts of mailboxes into functional décor. Get inspired! One gardening maven turned her old mailbox into a mini shed. It stays in the garden so that everything she needs is within reach, including gloves, shears, and seed packets. She loves how her things stay dry and clean outdoors! A cute idea for little ones, this mommy blogger had her father-in-law turn an old mailbox into a wall-mounted version for the playroom. Cards and letters from family go in here, but we could see a parent leaving all sorts of notes and things in one for their kid (or teen). Mounted on a wall, a mailbox can be used to store kitchen utensils, recipe cards, or a rolling pin in the hook. These can also be hung up in entryways or mud rooms to hold keys, jackets, junk mail, or umbrellas. One of the most popular ways to repurpose a mailbox is by converting it into a planter. A fun search with Google revealed numerous ways to garden with these. Check out what these folks did with a saw and some pretty paint! Those of you looking for a way to decorate your wedding gift table will find this idea to be clever. This blogger turned a flea market find into a cute box for wedding guests to leave cards. Depending on the size of your old mailbox, you can either hang the towels up like this mom did or roll them to tuck them inside. Some folks even hang one on their fence for pool towels. Paint it to go with your décor or go for the industrial look like the one pictured here by Bliss Ranch. Mom and daughter blogging duo The 2 Seasons transformed this one into a breadbox. Paint and decoupage are highly encouraged for this project to give it a vintage vibe. Store bread or whatever you want – the daughter admits she uses hers to store K-cups. Great idea! Help birdkind out by making a cute shelter. This step-by-step project from Our Fairfield Home and Garden involves a bit of elbow grease, but the end result is fit for luxe living strictly in the shady outdoors. Feel free to add amenities like suet and seed. How many ways can be mailboxes be used in bathrooms? Jewelry, hair accessories, and a blow dryer are neatly stowed together on the wall, in one convenient location. Flea markets, garage sales, or neighbors are great resources for snatching up discarded mailboxes. You can DIY these in multiple ways and keep them indoors or out. Perhaps your own creative spark will be lit to upcycle a mailbox in a way that no one else has done it. The only question is: what will you make? What do you think of these creative mailbox makeovers? Are you a fan of repurposing old objects? Do any of these projects spark inspiration for you? Tell us in the comments!